It is knockout week on MasterChef: The Professionals. 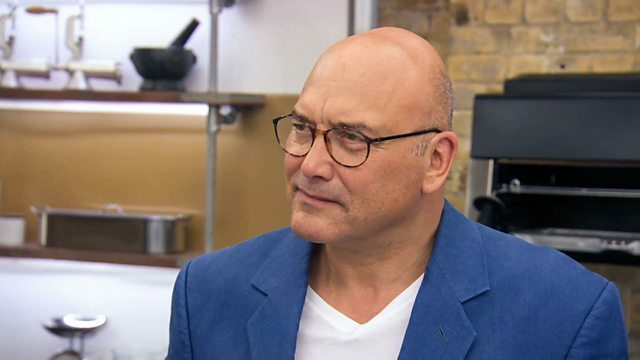 MasterChef presenter Gregg Wallace teams up with two of Britain's leading chefs - Michelin-starred Marcus Wareing and Monica Galetti. The kitchen is heating up as the judges' hunt for the country's next culinary superstar. After four weeks of intense competition, the 12 most talented chefs remain from the initial 48. Tonight, for the first time they all come together in the MasterChef kitchen, where their fate rests in an almighty cook-off. The first challenge for the 12 chefs is to cook against each other in the most intense invention test of the competition. They need to impress the three judges with one spectacular plate of food created from a heaving table of fresh sweet and savoury ingredients. But Monica and Marcus have raised the bar a little higher and challenge the chefs to the max by removing all the modern kitchen gadgets from the MasterChef kitchen. In the absence of a sous-vide or water bath, the emphasis is on classic cooking skills - plain and simple. With two hours and 15 minutes to create an innovative plate of exquisite food, they must seize this opportunity to make an impact on the judges. Only eight chefs will be guaranteed to move onto the next round. The weakest four need to dust themselves off and cook-off again against each other. In the cook-off round, the four remaining chefs have their final chance to showcase their talents to Marcus, Monica and Gregg and save themselves from being sent home. With one hour to create one perfect dish, it is time for the chefs to dig deep and muster their culinary magic and convince the judges they deserve to continue in the competition. For two chefs, it is the end of the road and they are sent home. The best two chefs from this round join the other eight and continue their quest to raise the MasterChef: The Professionals 2018 trophy.